This is the dessert to end all desserts. Fruity Pebbles and white chocolate chip cookies are sandwiched with sweet, creamy strawberry ice cream then, as if that wasn’t enough, they are rolled in more cereal to add a yummy crunch and colorful punch. They are kind of the best way to end summer. Only 5 days until school starts around these parts. Like I was saying on Monday, we’re trying to soak up as much summer as we can this week. 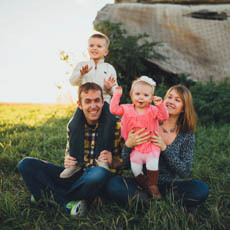 Hannah came down with a high fever on Monday afternoon so that kind of put a damper on the first couple days this week but we’re going full force the next few days and even skipping nap/rest time to squeeze in all the fun. For those that know me, you know it’s a big deal when I agree to skip those precious couple hours of peace and quiet. They help me not lose my ever-loving mind. So we’ll see what kind of mood I’m in by the end of the week. My prediction doesn’t look sunny. 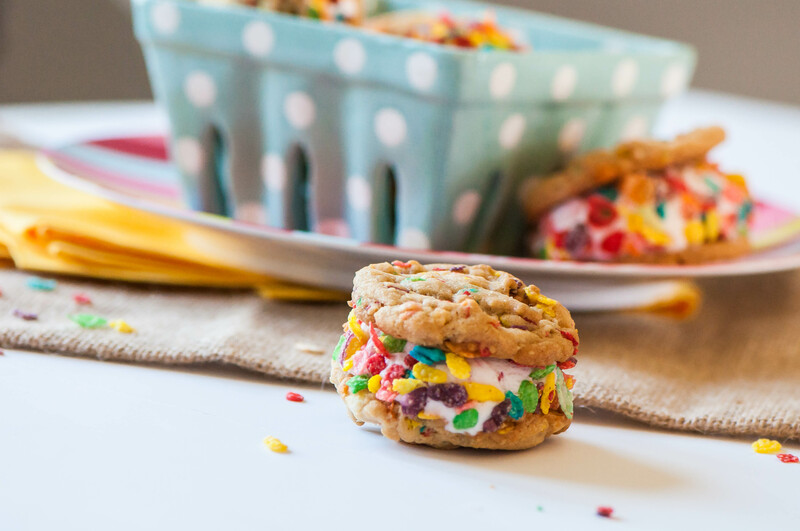 But if I had one of these ridiculous fruity pebbles cookie ice cream sandwiches in hand my mood would definitely improve. I love a cookie ice cream sandwiches (especially from my favorite local ice cream shop) but I surprisingly have never made them before. I’m not big into multiple step recipes these days because kids so I’ve always stuck to buying them. That all changed when I tried those fruity pebbles Oreos that everyone was raving about though. I was eating one or ten and thought, hey wouldn’t this be better with strawberry ice cream in the middle and white chocolate? Yep, it sure would. It turns out these aren’t so bad to make either when you start with a simple, favorite cookie base and store-bought ice cream. Ain’t no shame in my store-bought game. I tweaked my current favorite chocolate chip cookie recipe and jam packed it with white chocolate and fruity pebbles. I like to use a cookie scoop to ensure they are all the same size. Once they are baked and cooled, place a scoop of softened strawberry ice cream on top of one then place another on top and squish them together a bit. And because that’s not enough, roll them in extra fruity pebbles. Then wrap them in plastic wrap individually and freeze them until solid. Then give them to your friends and they will love you forever. I love the combination of white chocolate and strawberries with the extra fruity flavors of the cereal. The cookies manage to stay soft when frozen but the white chocolate chips harden which adds a nice crunchy texture to the sandwiches. This makes a huge batch (30 sandwiches total) and they don’t last a super long time in the freezer so make them for a party, bring them to work to bribe your boss or make a few deliveries to your friends. Whatever you do, find an excuse to make them. Preheat oven to 350 degrees F. Cream together the butter, shortening and sugars until they are light and fluffy. Add eggs, one at a time, to the sugar mixture. Add vanilla. Combine flour, cornstarch, baking soda and salt in a large mixing bowl. Add dry ingredients to the creamed mixture until fully incorporated. Stir in white chocolate chips and fruity pebbles. Line cookie sheet with parchment paper. Using a medium cookie scoop, portion out cookie dough onto sheet. Bake for 8-10 minutes until just baked. Remove from oven and allow to cool on sheet for 2 minutes then remove to a wire rack to cool completely. Grab ice cream from freezer about 10 minutes before assembly. Once softened, using an ice cream scoop place a scoop onto a cookie. Top with another cookie and squish slightly so ice cream reaches the edges. Place more fruity pebbles onto a plate and roll ice cream edges in the cereal. You may have to press it in lightly. Wrap each cookie sandwich in plastic wrap and place in freezer. Freeze for 3 hours until frozen solid. Enjoy within 1 week. Yum! I keep thinking about making homemade ice cream sandwiches as well but the multiple steps makes me rethink it every time. Maybe I need to give it a go!